I know you think these are the cards I posted yesterday but in fact they are not! They are completely different images. Okay okay the layout is the same SHEESH! I promise to try and post something good in the next few days but right now I am busy with Naomi again getting her settled in to the nursing home again for a few weeks. She looks pretty good and sounds good. Just hope she can get her strength up enough to come home soon. Oh anyway back to these two cards....don't forget to click on the picture and make it bigger so you can read the sentiment. I wanted to show you some close up shots of the leaves that I used to make a border and I actually meant to do that on yesterday's card but I guess I forgot *okie can hear her friend DCDoll saying "okie you are suffering from CRS again!*. I didn't go in any certain order, I just tried to mix up the colors. I do like the leaves being out of patterned paper as I think it adds a little more interest to them. You can also see the twine better in this picture. I really love using this medium to add to a card or layout. It is different than ribbon and it gives a more informal look at times. And another reason I love using it is because IT WAS FREE! My friend Linda, aka LGuild, gave me a whole big spool of it, and she can't have it back! On one of the images I added a few stray leaves on top of where there were leaves on the image. While I know I can cut leaves with my Cricut you guys know how I love my punches! I was totally against them at first but I think they are great for being able to use up even the most tiniest of scraps! 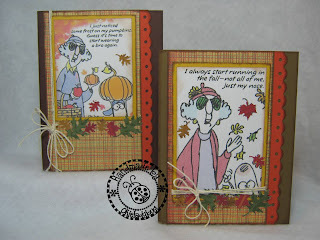 Linda posted her cards she made while at Stamp Club also. I think she cheated off me because I am almost positive I had started mine before she started hers! so be sure to check her Maxine cards ---> HERE <---. Sorry to hear about your friend Sorry to hear your friend Naomi is going to a nursing home, hope she gets well soon. Could we send you a card for her? Maybe that will cheer her up. 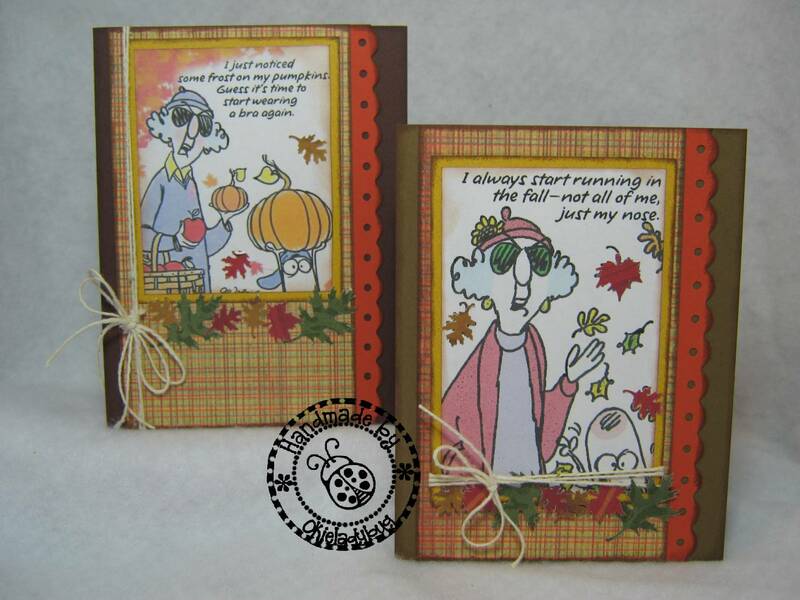 Loving your Maxine cards, sentiments are funny. I did check out Linda's blog, it is a cool blog, you 2 are lucky to be such good friends. The Maxine cards are so cute! 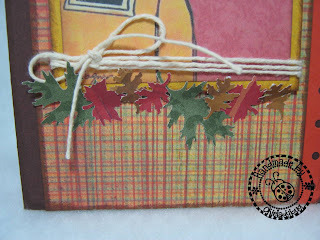 Just love the leaf punches and twine just the right fall touch. Hi, Okie!!! 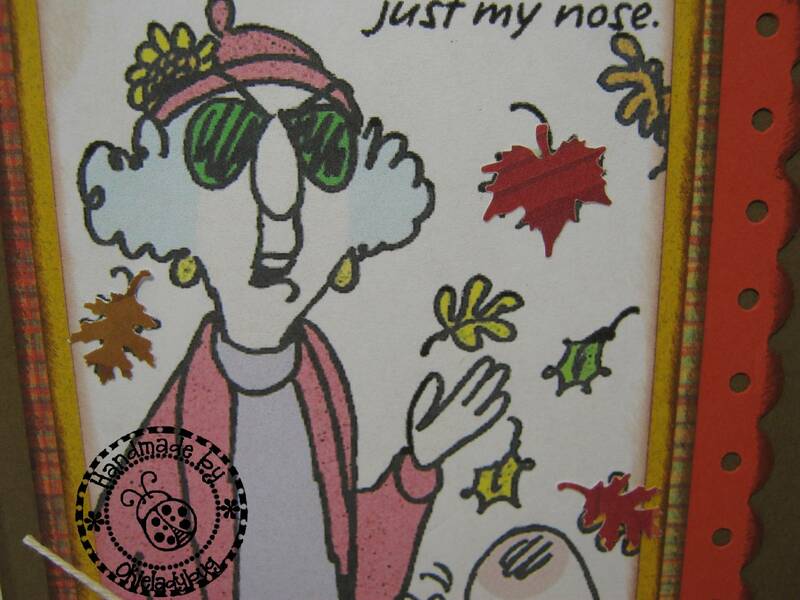 Love your cards and I really love that Maxine character -- lol!!! Love the Maxine cards. Your leaf border adds a great touch. Maxine is such a character ... she makes me laugh every time! 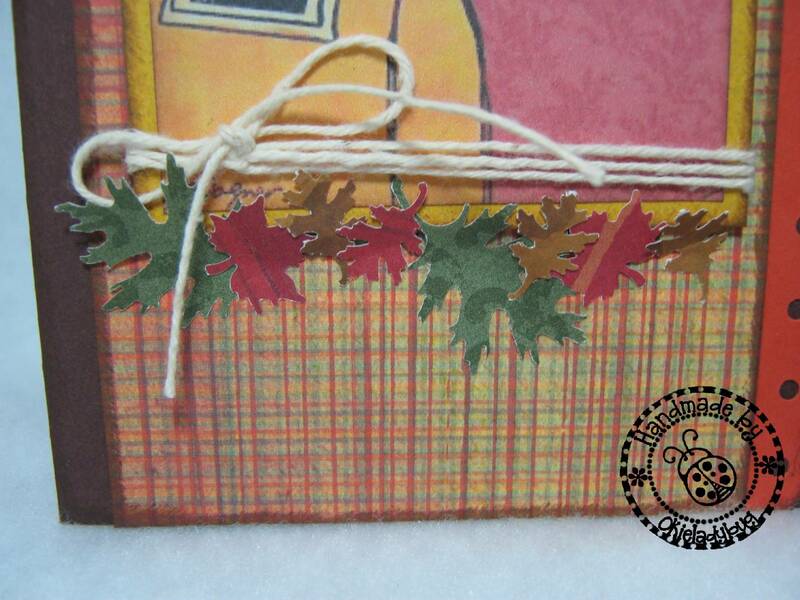 Love these cards too, the papers is great and the leaves and twine are great, a perfect embellishment. BTW, I hope Naomi is doing a bit better and will be home soon, I know how you worry about here. Oooh! Ooooh! You so totally DID NOT make yours first! LOL! Yes, yours are more elaborate than mine. I just wasn't in a card making mood that evening. I think it had something to do with the amount of food I ate at the Mediterranean restaurant! Hope your friend will be better soon. Maxine is my kind of woman. Love the leaves!!! :) What brand are your punches? 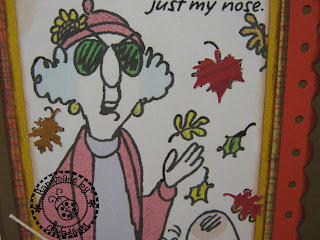 I just discovered your blog and love, love, love the Maxine cards. My office is totally covered with her (calendars, sayings, coffee cup, you get the idea)!